low carb breakfast recipes, low carb Indian veg breakfast recipes. The first meal of the day has to be filling and nutritious. In an attempt to cut down on the calories, you must not cut down on the nutrition aspects. Eggs are the most reliable low-carb Vegetarian source which is high in Protein. We do understand that egg works for some Vegetarians and does not work for others. Try having Omelettes made of egg whites for breakfast. Add to this a portion of fruits or one of the dashing fruit juices in this section, and you have a healthy breakfast ready. Try our sprout-based recipes like the Sprouts Dhokla, which is devoid of any flours but rich in protein. Moong sprouts panki recipe forms a perfect low carb Indian breakfast option with only 8.9 grams of carbs per panki. No time to cook anything is not an issue to stay on low carb healthy breakfast. We suggest you prepare Homemade Almond Butter and Homemade Peanut Butter in advance and store it in your fridge where it stays good for even a month. These nut butters are high in protein and has good fat. Just a tablespoon of this these butters is enough to fill your stomach and your out of the door in the morning. 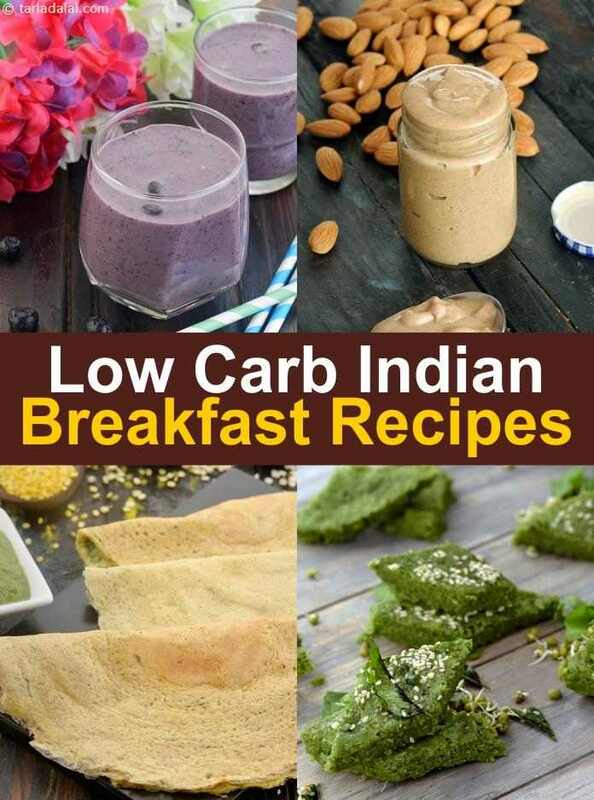 Enjoy our low carb breakfast recipes, low carb Indian veg breakfast recipes below and other low carb recipe articles.